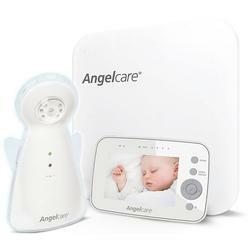 The Angel care AC1300 baby monitor features 2.4 GHz digital monitor transmission with hopping technology to minimize interference and optimize communication privacy and safety between your Nursery Unit and Parent Unit. It all started in 1997, when first-time parents Maurice Pinsonnault and his wife were feeling overwhelmed by the anxiety that all new moms and dads face. Knowing that their baby was sleeping safe and sound when they were not in the room was foremost on their minds. However, they were not at ease with traditional baby monitors, which only transmit sound. They wanted a monitor that could do more - one that would also detect movement, especially the subtle little movements babies make, asleep or awake. Hence Angel care was born. As one of the most trusted and innovative brands for parents worldwide, Angel care provides you with the best baby products to ensure the well-being of your little angels.